Vidici Ventures is a leading Nordic FinTech investor founded in 2012 by Founding Partner John-Christian de Champs, a serial tech-entrepreneur. Vidici works together with entrepreneurs and management teams to create winning partnerships to drive the development of high potential fintech companies. Our investment approach is focused on selecting the most attractive fintech companies, management teams and advisers and developing our portfolio companies over the long-term. The expertise and lessons learnt in scaling high-growth fintech companies over Vidici’s history is essential to a large and growing number of ambitious, fast-growing and emerging Fintech companies today. John-Christian de Champs, founding partner of Vidici Ventures. John-Christian is an experienced entrepreneur who has successfully founded and sold several rapidly growing companies. 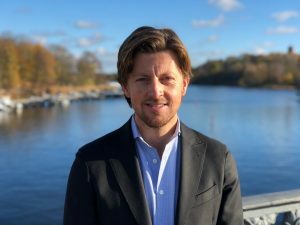 He has been a Board member of both publicly traded and privately held companies, and is a co-founder of Stockholms Affärsänglar (Angel Investors). John-Christian currently serves on several boards, including Lendify AB, Vidici Fund I and Vidici Fund II. His academic studies have been focused on law and business.